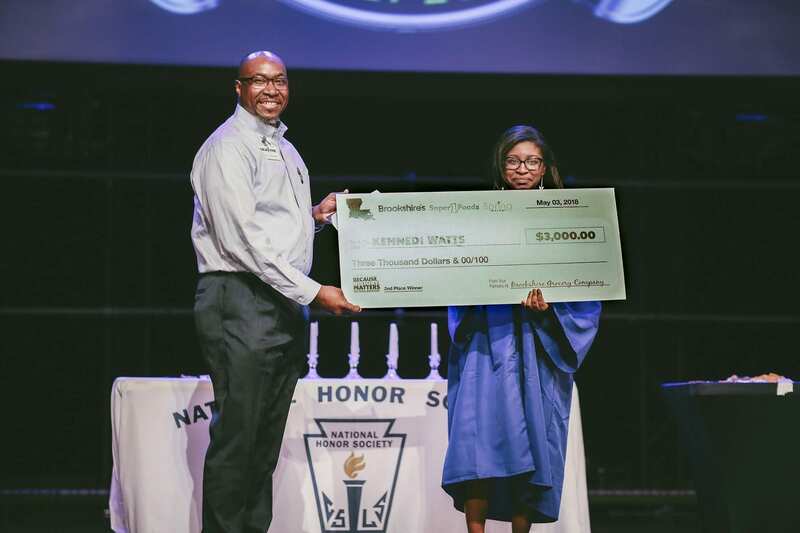 Dewayne Biley, Assistant Store Manager at Brookshire’s in Benton, Louisiana (left), presents a “Because History Matters” scholarship to Kennedi Watts, a senior at Word of God Academy. Four high school seniors from the Shreveport-Bossier area have been named winners in the “Because History Matters” scholarship program, sponsored by Brookshire’s, Super 1 Foods and Spring Market stores. Olivia Davis, a senior at Caddo Magnet High School, was named the first-place winner in Louisiana and will receive a $5,000 scholarship for her original essay about Charlotte Forten Grimké and her impact on history. Second place and a $3,000 scholarship were awarded to Kennedi Watts from Word of God Academy for her essay on author Langston Hughes. Dorcas Brown from C.E. Byrd High School placed third, receiving a $1,500 scholarship for her essay on Frederick Douglass. Lainey Smith from Caddo Magnet High School was awarded a $3,000 scholarship as a recipient of Brookshire Grocery Co.’s Employee Scholarship for her essay about Harriet Tubman. $38,000 in scholarships will be awarded to graduating high school seniors in the three states where Brookshire Grocery Co. operates stores (Texas, Louisiana and Arkansas), including separate scholarships for Company employees. Recipients were selected based on the content of their essay, along with their academic achievement, financial need and demonstration of leadership including awards, achievements, extracurricular activities and community service. A cumulative GPA of 2.5 or higher was required to apply.